LFE is "Liquid Fuel Emergency." 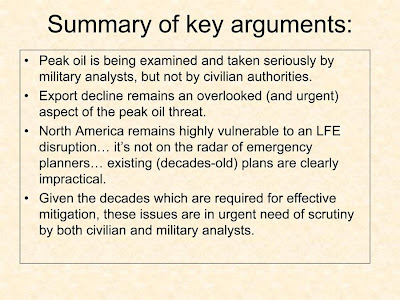 Various military reports have come out recently that analyze the apocalyptic threat posed by peak oil. The most notorious of these, from a German military think tank, warned of market failures and a crisis of political legitimacy and proposed ways to manage the risk. Nothing comparable, however, has been issued by U.S. civilian authorities, like the FDA and the DoT. Energy Securities Analyst Rick Munroe made these claims in an awesome presentation at the recent ASPO-USA conference. He says we're ignoring a major strategic shock that has been visible for decades. "Like the inhabitants of Pompey who ignored the neighboring volcano, Vesuvius, until it detonated, the world ignores the possibility of Peak Oil at is peril." If something cannot be sustained, it will eventually not be sustained… ultimately it will shrink. Secondly, you cannot produce oil unless you first discover it (a contribution by Colin Campbell). Third, a resource that is finite cannot continually have its production increased. 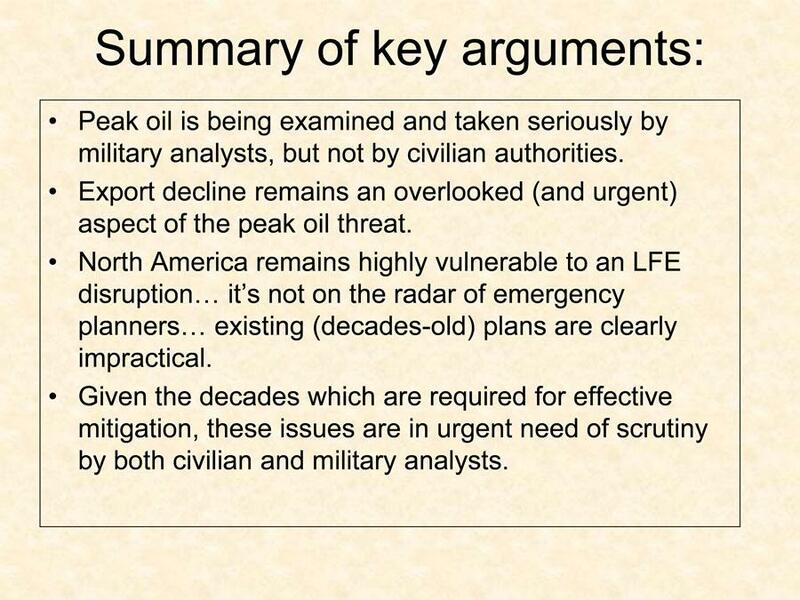 Dr. James Schlesinger "The Peak Oil Debate is Over" from ASPO-USA on Vimeo.